Alexander Walters was born in 1858 into a slave family in Bardstown, Kentucky, the sixth of eight children. By the age of ten, Walters had shown such academic progress that he was awarded by the African Episcopal Zion Church a full scholarship to attend private schooling. In 1877 at the age of nineteen, Walters received his license to preach and began his pastoral duties in Indianapolis, Indiana. In his career as a pastor, Walter served in cities across the country including Louisville, San Francisco, Portland (Oregon), Chattanooga, Knoxville and New York. 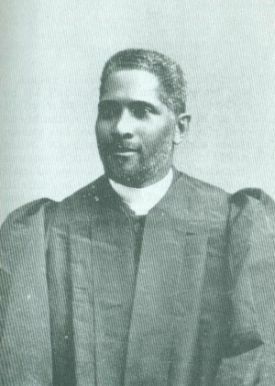 In 1892, as a minister at the Seventh District of the African Methodist Episcopal Zion Church, Walters was selected as bishop. In 1898, Bishop Alexander Walters began to devote his attention to the ongoing African American civil rights struggle. In partnership with T. Thomas Fortune, the editor of the New York Age, Walters founded the National Afro-American Council and served as its president. This organization focused primarily on challenging racially discriminatory legislation and in particular the “separate but equal” Plessy vs. Ferguson U.S. Supreme Court ruling in 1896. Walters also challenged Booker T. Washington’s ideas of accommodation to segregation and discrimination. Bishop Walters, in partnership with W.E.B DuBois, was a member of the 1908 Niagara Movement from which he helped in organizing the founding conference of the National Association for the Advancement of Colored People (NAACP). Walters became vice president of the NAACP in 1911. Bishop Walters declined an invitation by President Woodrow Wilson to be minister (ambassador) to Liberia in order to prompt AMEZ Church education programs in the United States. Until his death in 1917, Bishop Alexander Walters continued to remain active in his leadership of AMEZ Church affairs and maintained his devoted support as a formidable civil rights advocate of the late 19th and early 20th centuries. Kwame Appiah and Henry Louis Gates, eds., Africana: The Encyclopedia of the African & African American Experience, Vols. 1-5 (New York: Oxford University Press, 2005); Randall Burkett and Richard Newman, eds., Black Apostles: Afro-American Clergy Confront the Twentieth Century (Boston: G. K. Hall, 1978).